Important: Always be absolutely certain of what you are gathering when you harvest wild mushrooms. Although we have many fine edible fungi in Nova Scotia, there are also ones that are deadly poison. Before you choose to harvest, either go on a mushroom walk with an acknowledged expert, or purchase one helluva book. "You see," said Docaitta, "that's my fear. If I pick something wrong I may just disappear altogether!" We've all heard tuna called "chicken of the sea." Well here's a substitute that you don't have to get wet catching – Chicken of the Woods. The proper name of this mushroom is Laetiporous sulphureus, and it grows worldwide. It's actually very distinctive and is difficult to get wrong. The taste is described as "lemony chicken." I have not found any references to "similar but poisonous" mushrooms to be wary of when hunting this tree-bound fowl. Like most mushrooms, it primarily fruits in the fall, but it can also be found during spring and late summer. It is a saprophyte, meaning it decomposes and digests wood. * Sulfur shelves are therefore most common on rotting logs and dying trees, but can be found on rotting wood that is buried beneath the forest floor. Unlike many wild mushrooms, it doesn't have any trouble establishing itself on conifers, so they aren't limited to growing on hardwoods like many other edible species. When collecting this mushroom, you will notice that it oozes a lot of water when it is cut; sometimes enough to soak your entire hand. Laetiporus is a genus of edible mushrooms found throughout much of the world. 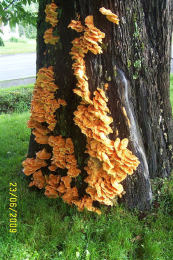 Some species are commonly known as sulphur shelf, chicken of the woods, the chicken mushroom, or the chicken fungus because many think they taste like chicken. The name "chicken of the woods" is not to be confused with the edible polypore, Maitake (Grifola frondosa) known as "hen of the woods", or with Lyophyllum decastes, known as the "fried chicken mushroom". l-r: maitake and lyophyllum. I don't see any resemblance. It's important to note that you should only eat the outer growth layer of the mushroom; there are concentric lines on the cap, indicating different phases of growth. If you eat the older parts of the mushroom they will be both tough to chew and tough to digest. As with all wild mushrooms, or any other food for that matter, it's best to try a small portion at first to see if it agrees with you. The mushroom can be prepared in most ways that one can prepare chicken meat. It can also be used as a substitute for chicken in a vegetarian diet. Additionally, it can be frozen for long periods of time and retain its edibility. In certain parts of Germany and North America, it is even considered a delicacy. However, a small percentage of people can have an allergic reaction when ingesting it. To quote Dr. Michael Beug (author of "An Introduction to Mushrooms") it "causes mild reactions in some, for example, swollen lips" or in rare cases "nausea, vomiting, dizziness and disorientation." This is believed to be due to a number of factors that range from very bad allergies to the mushroom's protein, to toxins absorbed by the mushroom from the wood it grows on (for example, Eucalyptus or Yew), to simply eating specimens that have decayed past their prime. As such, many field guides request that those who eat Laetiporus exercise caution by only eating fresh, young brackets and begin with small quantities to see how well it sits in their stomach. Chicken of the woods are available late summer through the early fall. Colorful fan shaped chicken of the woods mushrooms are bright orange yellow to deep salmon in color. Their vibrant color fades as they age or if they grow in direct sunlight. They have a smooth to slightly grooved suede-like surface and their underside is composed of tightly packed pores rather than gills. Releasing a characteristic rather potent aroma, this mushroom is best enjoyed when it is young and tender. The texture and taste is much like that of cooked chicken, hence its name. Mushrooms provide a good source of protein, fiber, a substantial amount of B vitamins, copper, and other minerals. Sugar-free, one cup of raw mushrooms has about 20 calories. This mushroom complements a variety of chicken dishes. 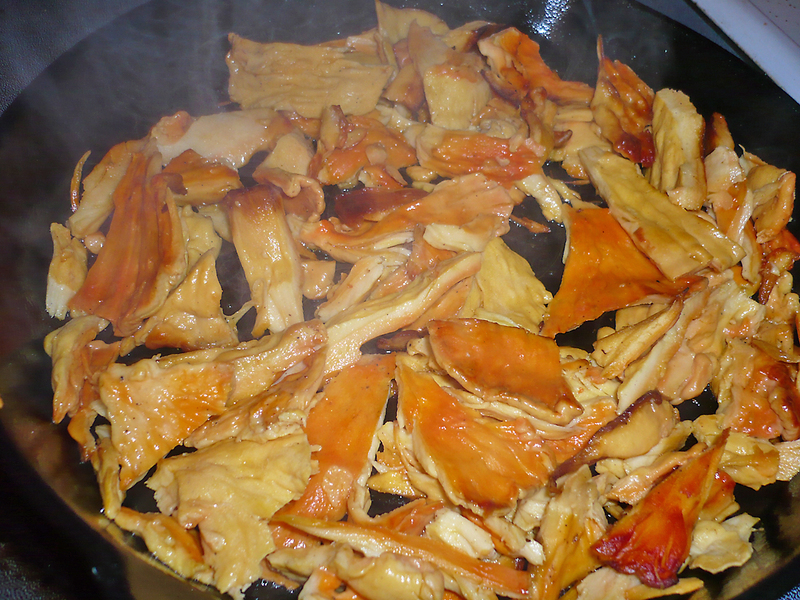 Boil mushrooms in a strong chicken broth flavored with onion and salt until tender. Cooking time can vary from a half hour to several hours, depending on the mushroom. Gently sauté thin slices in butter with chopped shallots and green onions; flavor with favorite seasonings and fresh herbs. Braise mushrooms in a broth; remove and thicken the liquid; add cooked mushrooms and serve over freshly baked croissants. To store, refrigerate unwashed mushrooms in a paper bag or between damp paper towels. Do not seal in plastic. Do not wash mushrooms until ready to use. Chicken of the woods mushrooms can be found growing throughout North America. They are found growing higher on both hardwood and softwood trees trees and not on the ground. The exception is when the tree has fallen and the mushroom was already growing on the host. * A note of caution: Do not harvest chicken of the woods which has grown on Yew or Eucalyptus trees. On these hosts it is potentially lethal. Sauté all ingredients, except the bread crumbs, walnuts, mustard and lemon juice in the olive oil for 15 minutes, or until beginning to brown. Combine the mustard and dijon. Mix with the remaining ingredients, except for half the mustard mixture. Transfer to an oiled baking dish and spread with the remaining mustard. Bake for one hour in a preheated 375° oven. Cook covered for more tender mushrooms and uncovered if you prefer crisper mushrooms.